Home / AGM / Our New League President! 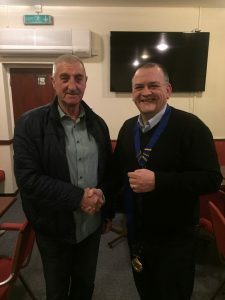 Our new League President is Mick Jones, who was our chairman from 2015-2018. We would like to thank Mick for taking up the position and look forward to seeing him at our big events, starting with the Anniversary Competition at Donnington Wood on Sunday 31st March. Chairman Mark Shore presents the President’s Chain to Mick Jones.